We’ve had a very busy month. In addition to our usual activities, Glideslope Software is now reborn as Smarter Technologies, and we spent a few days helping our client, HARP, with their new interactive touchscreens or smart monitors. HARP is a homeless charity which is based in Southend, Essex and provides emergency housing and essential services to local people. A life-line for many young adults in Essex, HARP needed a reliable and easy to use solution which could be installed with little fuss. 2 smart monitors needed installing; one in their Bradbury Centre (emergency accommodation) and the other in the Dencora Building (administration). The primary aim of this project was to improve the flexibility of both the buildings’ uses therefore monitors which are multi-use were chosen to give plenty of options for presentations and entertainment for the charity. We recommended a 70″ Interactive Touch Screen with amplified 60W Speakers for the Bradbury Building and a 65″ Smart TV (also with amplified 60W speakers) for the meeting room at the Dencora Building. Both these models are incredibly versatile and user-friendly – perfect for HARP as a variety of people would be using them. We identified a couple of issues during the installation; nothing major – for the Dencora Building, we had to adjust the height of the speakers on the wall and for The Bradbury, there were some challenges with bringing the equipment into the building, however, both of these issues were managed with comprehensive planning in advance of the installation, and we completed our installation comfortably within our timescale and budget. The smart monitor models chosen are very adaptable as they can be used for presentations, or for entertainment. They are each supplied with a PC, but they can be used with other laptops, depending on the user’s requirements. One of the special features of the BenQ Interactive Touch Screen is that it is fully touch sensitive and can be controlled from the screen by fingers or stylus. The monitor can be used as a tablet computer too by using its full android system as well as a whiteboard because of its sensitivity to touch. Before we handed over the hardware to HARP, we provided a short training course (only 30 mins) to key staff in the Dencora’s meeting room and a longer demonstration to the Bradbury staff (2 hours). Not including the travelling time, the installation for both sites took almost 12 hours, but this meant that the smart monitors were correctly installed, working and staff were trained allowing HARP to start using their new systems immediately. “As a group facilitator here, and as someone who co-ordinates a lot of other group interventions, I have found our new interactive smart monitors to have been a fabulous boon to everything I run here at the Bradbury. It has increased attendee participation, made any group instantly feel more up to date by using it. I have personally found the ability to prep in advance and access the prepped materials invaluable. 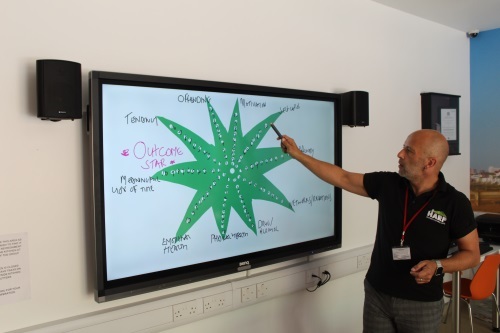 The speed and fluidity of going through the sessions on screen has been amazing – it really makes the display appear to be integral to the discussion.